The work you do, no matter what it is, can bring glory to God. Some people have made choices that put them in the right place at the right time – answering a calling. God can guide your path by offering you choices that lead to your calling. Some people search their whole lives for a calling, while others know they are in it. Moving into management/leadership positions takes just the right combination of education and experience, planned by God of course. It can be a calling that allows you to glorify God; if you want to see it that way. In a leadership role, we are privileged to guide, develop and shape other leaders. There are times when it’s frustrating and we’d like to “just do our job and be done”. That isn’t what God called you to do. Your life at work and at home will influence what type of leader you are. If you watch a lot of “educational” television, the shows that teach you about places and things that you never knew, you probably find that you are teacher at work; rooted in your interest to learn. Take notice of what you do, read, view and spend time doing and you’ll see that its reflected in your work and your leadership practices. “Live a Godly Life” is great advice and probably one of the hardest things that we, as sinners, can follow completely. This doesn’t mean we shouldn’t try. By being nurturing, forgiving, understanding, slow to anger, patient, honest, trustworthy and caring is how we start. This will help us do our work in God pleasing ways and honoring Him in the process. You have received two callings as a leader, both from God, one to lead others and the other is to do it as a disciple of God. Live your life in a worthy way because the responsibility of what you have received is awesome. The now confirmed nuclear detonation is starting to take its toll. The evacuation of half a million people has been ordered by the governor and shelters are starting to open. Four military hospitals are in bound and an “emergency room” type facility has already set up. To date, more than 4000 people have been rescued and over 2000 victims have been decontaminated. We started overnight operations last night and will run 24 hours for the next 14 days. Twenty helicopters are moving victims and supplies throughout the area. We are actually working in Indiana on two bases that are about 60 miles apart. As of last night, 3659 people are assigned in some role to this exercise. 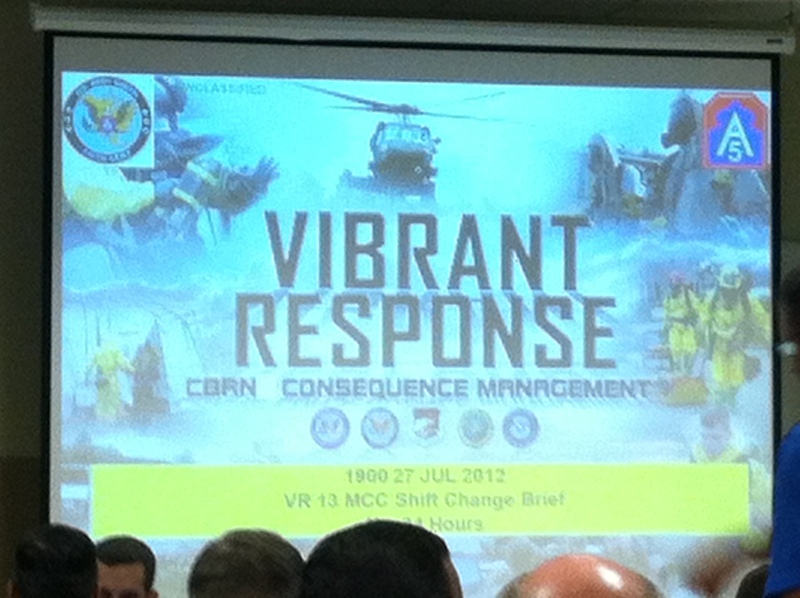 We have two daily briefings 7am and 7pm, below is a photo of the start of the 7pm (1900hrs) briefing. The briefings are for the Commanding General of the 5th Army (3 stars) and his staff. We have been working through the challenges of managing air, land and human resources. The progress is slow for this training event. The other photo is a close up of the title and logo for the event. Needless to say, I’m very happy and proud to hear these comments. We expect the book to be published by the end of October and will be available in electronic or paperback versions. 1996 American LaFrance Pumper with fresh paint and a light package. I’ve have nothing related to my writing or business but this is something that I’m excited to talk about. My work with a local community college has kept me busy for the past few weeks working as we’ve on ordering equipment, hiring instructors and taking delivery of a fire truck for the new fire academy. 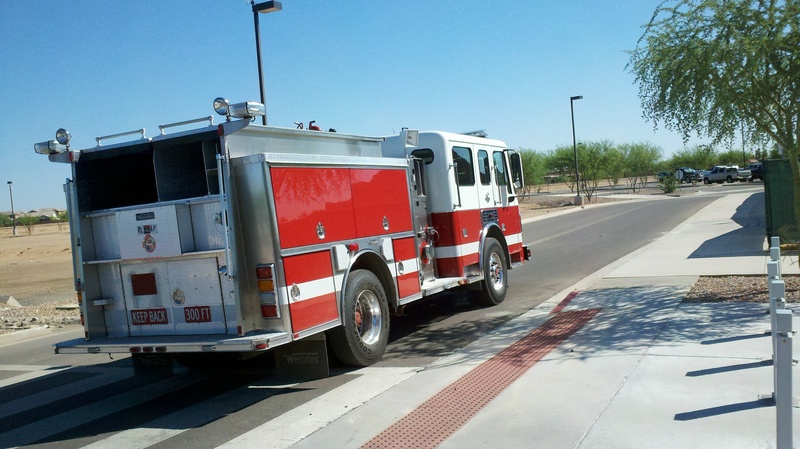 It has been fun and a lot of work, so I thought that I’d share a photo of our new fire truck. It has been a long time since I purchased a truck, let alone a used one. Just like buying a used car, you never really know what you’ll get. This is a very clean truck and will serve our students well for several years to come. We have also reviewed a number of applications for both Instructor and technician positions. We’ll have a great cadre of instructors to ensure that the students get a great experience and come out ready to serve their communities. Tomorrow’s post will be back to the exercise in Indiana, today is a little slow as forces move into the area. Initial National Guard troops are on the ground looking for victims and establishing control zones with four specific missions. The President has declared a disaster allowing the US Army forces to deploy into the area over the next 24-36 hours. In the real-world, the weather is the story here. I haven’t seen dark brown and dried lawns like this since the late 1980’s. Corn crops are short and several fields have already been plowed under and being replanted. The temps have been in the upper 90’s with humidity in the mid 50’s. The AC in our command and control building was out yesterday afternoon and this morning. I shouldn’t complain but with a room full of people and computers then topped off by no air movement, it got a little uncomfortable. A cold front is coming through this afternoon, with severe weather and cooler temps behind it. They are predicting a great weekend, good for the troops, no difference to me. God has truly blessed us each and every day. As leaders we have been given a wonderful gift; the gift to lead others in their vocation. We have an awesome responsibility to provide our co-workers with direction to meet stated goals, to share our knowledge with them, to learn from them and to help them achieve all that they can. God is working through us so that they will not lack anything as they too, go to work for us. Our good work has put us in a place of influence. We influence business decisions, team direction and the growth of others. When you take a minute to think about it, that can become very overwhelming but isn’t that what we signed up for when we accepted our position? God knew that we were able to meet the challenge because He has been with us from the start, whether we knew it or not. How has the Lord your God blessed you in the all the work of your hands? Maybe He put people in your life to show you the glory of His name. People to teach and mentor you in your vocation to reach this position. Many people will say “it was a stroke of luck that I was assigned to that project, without it I would never had gained enough experience to be considered for the promotion.” We should really be thanking God for that experience; it was His way of ensuring that we didn’t lack anything. Have you thanked God for what He has done for you lately? Our Father would like to hear it from you; this is not the time to think “He knows”. One of the biggest challenges in leadership is found in the old saying “it’s lonely at the top”. We may never hear what a great job we’re doing from those that work with us but God has surely blessed us with this work of our hands, be sure to thank Him for those blessings. One of the many hats I wear is one of a Military contractor, specifically the U.S.Army. Tomorrow, I’ll embark on a three week journey to, hold your breath, Central Indiana. I will be participating in a National Level Exercise (aka, War Game) for our Homeland Defense Forces under the direction of the Joint Task Force – Civil Support command, an arm of the US Northern Command. The exercise will include 4000 soldiers from around the country and about 1500 contractors and support personnel. 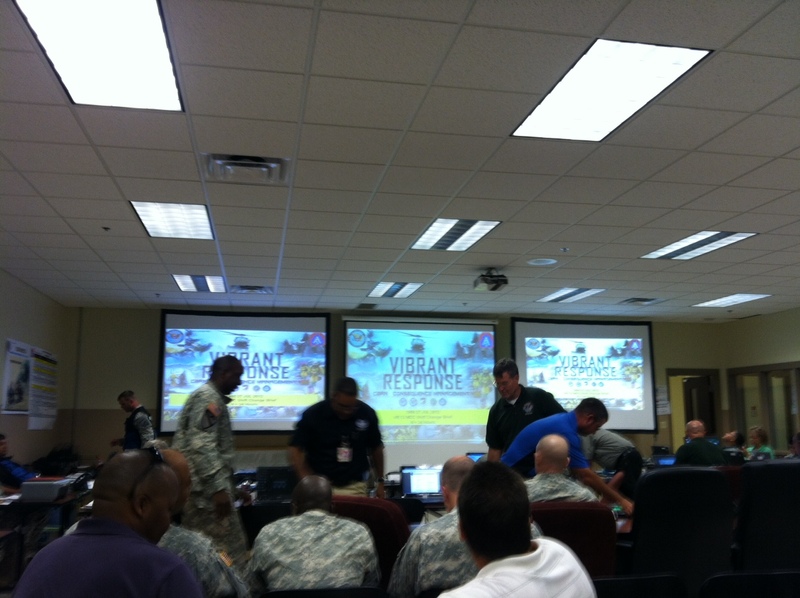 My “plan” is to blog regularly about what we are doing in support of the exercise. I need to apologize up front over the general nature of the posts as I’ll speak in generalities due to the security of the mission. I will be functioning as an Assistant Area Commander over seeing multiple civilian command posts. The troops work for these CP’s as they work to complete their missions. The US Military can only operate on US soil under the direction of civilian commanders except during a war. We are providing that layer for them. I hope you will keep reading during this time, it should be interesting and a complete change for what I’ve been doing the past few months. Some in leadership positions believe in the RHP principle; rank has privilege. They believe that since they are in charge that certain privileges and rights are solely theirs; that others serve in support of them and at their will. This of course, could not be farther from the truth. Our job as leaders is to provide our people with the tools necessary to do their job; these tools include physical property and the knowledge and understanding to get the job done. We cannot support them if we aren’t working for them and they can’t support you if they aren’t equipped for the job at hand. Over the years, a lot has been written about the concept of servant leadership; when you lead others by serving them and helping them to be successful. A manager has the freedom to do what they want to and they can choose how it’s done; it’s the privilege of being a manager (having rank). If however, you are a leader, you will not use your freedom to indulge in RHP (sinful nature) but will serve others as you lead them. We all enjoy freedom and God has given us the ability to make free will choices. Free will means that we are not bound to anyone or anything, but we need to remember the first commandment – “You shall have no other God”. Do not be bound by your love for material things, possessions, positions, money, etc. You are free to choose to give your love to God and serve Him. Do not indulge in the sinful nature and avoid the traps of living today. We should serve one another in love. Jesus gave us a great example of serving others in love. He knew what people were thinking, he performed miracles, he was presented gifts and he was free to roam the countryside. He served in love, He taught along the way and showed us the way through His life. Most importantly, he gave himself for us as the ultimate demonstration of being a servant leader. Good communication skills are critical to the success of any leader. Leaders must not only hear but be heard and when this doesn’t happen, the trouble starts. There are several communication techniques that work fairly well and all that focus on the needs of the receiver, not the sender. As the sender of information, your goal is to have the receiver understand the message and be able to do something with it; learn from it, use/apply it, store it for reference or reply to it. As a leader you have the responsibility to ensure that your messages are being understood. Sometimes we can see in the receiver’s eyes or on their face that they didn’t clearly understand what we wanted them to. We have to send it in a manner that they understand. If the message is of great importance, a good tool to use is one in which you have them repeat it back to you in their words to confirm understanding. This form of mirroring occurs naturally in our mind and should not be construed as an insult if you deliver it with care. The best way to reach your people is to find out how they need to be communicated with. Some people like plenty of detail, while others just want the big picture and will take care of it from there. Do you know how you need to be communicated with? Some leaders are so busy that they request things via e-mail or report and others want short, yet detailed verbal encounters. Every person is different and you are no exception, make sure your people know what you need while you are finding out what they need. The bible teaches in Romans 10:9-10 us that the gift of eternal life comes from believing in Jesus Christ and professing that faith to others. What is your understanding? How well do you know the promises of God in the bible? The bible urges us to seek greater understanding of God’s word and use the examples given to us by Jesus as a guide for our lives. How do we improve our understanding of the Word? Daily devotions, bible study and regular worship are great places to start. Find the tools that work for you. It may take a lot of searching for you to find the right devotional or bible study but when you do, seize it and work to seek understanding. Study bibles offer a great glimpse into the meaning behind the Word and the connections that are made between bible verses. You’ll spend a lifetime seeking understanding, remembering that it is the “fountain of life” and you’ll have all of eternity to enjoy it.